I looooove waffles, especially before church on Sunday mornings. This is the best waffle maker. 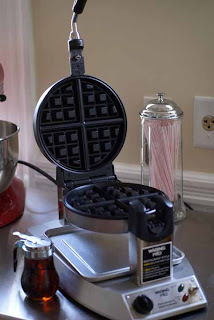 It is fast, beeps at you when the waffles are done, and pops out waffle perfection every time. My new obsession is NUTELLA! Nutella and waffles are a dangerous combination for the waistline. Spread a little nutella on a warm waffle. Go ahead, have some for dinner! I love your straw holder in the back! Wonderfully cute! :) And enjoy those waffles, my kindred aqua and red kitchen friend! Thanks, Lauren! My mom bought that straw holder for me as a treat! Mmm, Nutella... What brilliant person came up with the stuff? I'm getting hungry just thinking about it!